Copping a Big Mac in a $500k whip is the ultimate in high-low tastes. Kanye West, who lives in the hills of Calabasas with his wife Kim, was really craving some french fries this week. He passed up the (arguably better) California burger chain In-N-Out, and headed to McD’s for a Happy Meal (or whatever the hell you order if you’re Yeezus). In classic Kanye fashion, he rolled up to the Golden Arches in a $500k whip. 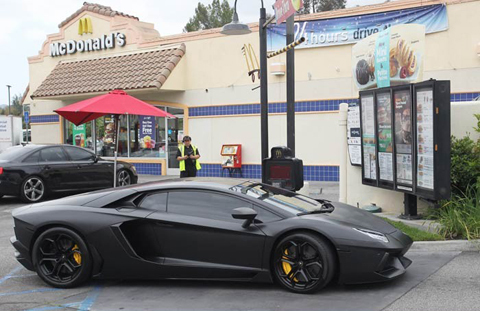 Getting a Big Mac in a Lamborghini is the ultimate in high-low tastes. We salute you, Yeezy, and the fact that you could obviously not give less of a f*ck about keeping a low profile while copping a burger. It should be noted that Ye is a fan of chain restaurants other than McDonald’s: Before his performance at the Brit Awards at 02 Arena in London, Yeezy stopped by the popular South African chicken chain Nando’s for a quick meal—his alleged order: “a plain burger and chips, a medium double burger, 1/4 medium chips and garlic bread and 1/4 chicken hot 2 spicy rice”—and a chance say what’s up to some very surprised fans. ‘Ye being ‘Ye, he literally climbed up on the counter and orchestrated a gigantic group selfie. Good to know the god complex is fully intact, even at chains like Nando’s and Mickey D’s.